This colorful dessert is very easy to bake, takes only a few minutes to prepare and comes as a favorite afternoon tea time snack during the summer. Wash the cherries and remove the stems. Dry them completely. To make the custard, combine the flour, sugar and salt in a mixing bowl. Slowly add the eggs and the cold nut or soy milk. 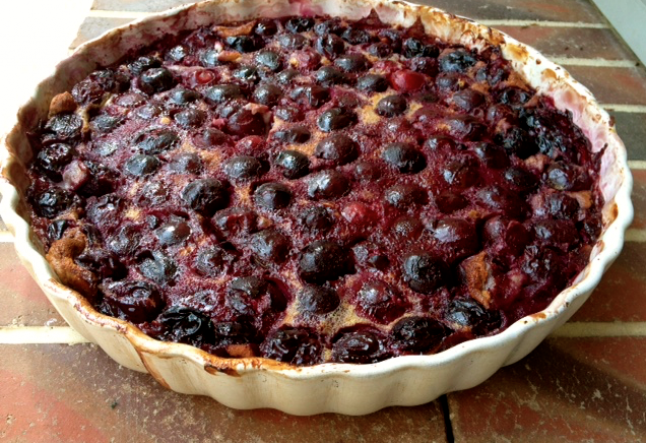 Place the cherries in a tart dish, and pour the custard mixture all over them. Bake for 45 minutes at 200 Degrees Celcius or 350 Farenheit until the custard is set and the top is golden brown. You can serve warm or cold after drizzling some coconut sugar or some lemon juice on top.